We’re proud to present you our 2019 line up! This year, the green fields and hills of Het Twiske will be home to 8 different stages. Each stage is conceptually unique, with a carefully selected sound and perfectly matched design. No matter where your journey will take you, every floor will present itself in a creative an intimate way, offering plenty of space to dance and to make new friends. We’re extremely excited to have Sven Väth and Joseph Capriati headline our Main stage. Both will be making their Welcome to the Future debut this summer! Next to them, we welcome Adriatique, Enzo Siragusa b2b Archie Hamilton to play our festival for the first time. Our family member Ici Sans Merci is representing the local scene on our center stage. Following the tradition, our biggest tent will be filled with top-notch Funktion one sound systems and trippy visuals. Sam Paganini, Dax J and Rodhad are in charge of this Techno heaven, alongside with Matrixxman, Kobosil, Juan Sanchez and Tahko. Just imagine yourself dancing eyes closed to relentless, pure Techno, side by side with newly made friends. More legends and pioneers of the international House and Techno scene will be joining our 13th outdoor edition! Nobody less that Floorplan aka Robert Hood, Matthew Johnson (live), Derrick May and Fred P are calling our House stage their creative playground in July. Welcome to the Future father and founder Gert van Veen aka Quazar (live), Sandrien b2b Carlos Valdez and Times Are Ruff will be joining them to honor the stages’ name. 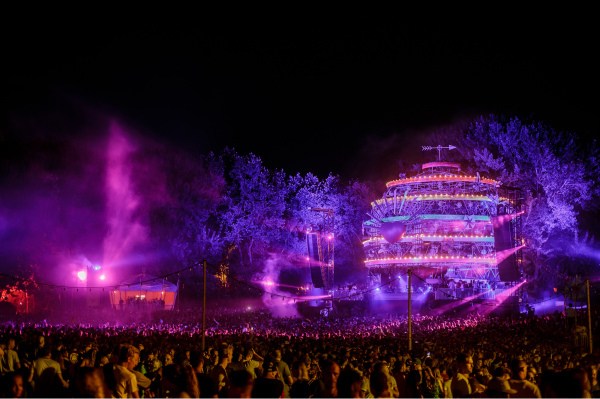 In the realms of the Aurora… Derrick May an Dj Rush will take over this new stage concept alongside with Fjaak (live), De Sluwe Vos, Steve Rachmad, Lewski and Titia. Expect an inspiring outdoor space, feeling like a small party on its own, enriched with light effects following nature’s geometrical shapes. Amsterdam is a stage that accompanies us since the very first edition. It is dedicated to the hottest local talent and some of the best friends of the Welcome to the Future family: Detroit Swindle, Boris Werner, Ferro, Dorine Dorado and Darling b2b Tracey. This season, Amsterdam will present itself outdoors, on a new location and in a new design. An absolute must on your timetable! More hot Dutch sound will be provided by Secret Cinema, Bart Skills, Prunk & Chris Stussy, Samuel Deep and DJ Windows XP in our Salon. And, the boys invited ANNA to join the club! This floor is literally a living room and located on a grassy field near the waterside. Tucked away between bushes, the Garden is intimate, natural and loaded with a deep, profound sound. The following artists will join forces to transform it into a magical space for unexpected encounters to occur: Lövestad, Frits Wenting, Daan Groeneveld, Spaceandtime and Pablo Discobar Soundsystem. Get in and get lost! If you have ever been on our terrain, you might have wandered the shore of the Twiske lake. It is there, away from parties and busy dance floors, where we’ll be setting up a sacred space for everyone interested in the deeper effects of sound. Curious? Details will soon be shared with you! We hope that you’re as excited as we are! Early Bird tickets are sold out.